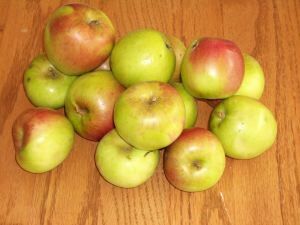 It's apple picking time in Kaleberg Kountry again, so we checked out our favorite abandoned orchard and there they were. Last year, they were feral green monsters. This year, they had a nice red blush on them, but they were as tart and tasty as ever. No more supermarket woolens for us. New York City may be a summer festival, but we Kalebergs tend to melt in the sun. The summer is not our season, but thanks to our high tech Cool Vests, and despite the collapse of the St. Regis Hotel, we managed a great trip and found a great new restaurant, Esca, walked everywhere, and enjoyed two great museum exhibits. 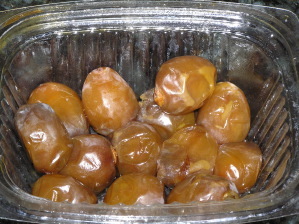 We also tried some barhi dates (see below). To find out more, read The Kaleberg Report. 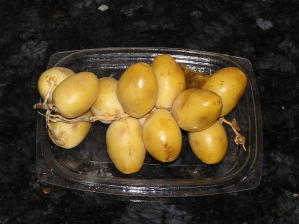 We happened to be in New York City when the fresh Barhi dates arrived. They had them on the stalk at the counter at Kalustyan's, so we had to try some. The fresh dates (on the left) are sweet with a strong tart note, and even a bit of astringency, but if you let them sit for a week or so, they ripen (on the right) and are amazingly sweet and tender. Most dates sold in this country are dried out versions of the ones on the right, so this was a real treat. Well, it's about time. We're back from New York City, so it's time to post a couple of reviews from August. Go figure. We finally checked out Lake Crescent Lodge, and we were impressed. We also checked out Sabai Thai. We had tasted some of Victor's cooking before, at a friend's house, but his restaurant is really impressive. Who ever thought of Thai cooking with great Northwestern ingredients? It really works.